I can't count the number of times I've recommended this collection to friends and customers wanting to add some edge to their library. Think of Mr. Keret as Israel's answer to Chuck Palahniuk (only so much better). You'll laugh, cringe, shudder, and gawk at this fresh and culturally vital voice. (P.S. last story is source material for indie darling Wristcutters: A Love Story). Classic warped and wonderful stories from a “genius” (The New York Times) and master storyteller. New to Riverhead’s list, these wildly inventive, uniquely humane stories are for fans of Etgar Keret’s inimitable style and readers of transforming, brilliant fiction. Etgar Keret was born in Tel Aviv in 1967. He is a recipient of the French Chevalier de l’Ordre des Arts et des Lettres, a lecturer at Ben-Gurion University of the Negev, and the author, most recently, of the memoir The Seven Good Years and the story collection Suddenly, a Knock on the Door. His work has appeared in The New Yorker, The Wall Street Journal, The Paris Review, and The New York Times, among many other publications, and on “This American Life,” where he is a regular contributor. 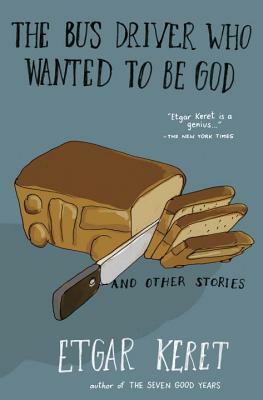 “Etgar Keret’s stories are funny, with tons of feeling, driving towards destinations you never see coming. They’re written in the most unpretentious, chatty voice possible, but they’re also weirdly poetic. They stick in your gut. You think about them for days.” – Ira Glass, host and producer of "This American Life"